Thanks to the uprising Virtual Reality technology and the blooming VR headsets, you don’t need to head up to theatre to enjoy your movies in an immersive environment with the lights off. With a VR headsets on your head, it’s easy to replicate an environment, real or imagined, and simulate your physical presence and environment in a way that allows you to interact with it, and make you feel like you are sitting in a 3D movie theatre where you can look around and towards the screen where a video is being played. However, the best VR movie is not easy to find and some videos might not be suitable for your VR headsets owning to the conditions. What you can do: Get a VR Video Converter to transcode and convert all your non-VR video files to a VR SBS format supported by VR heasdet, change a VR video format/resolution to be available to VR Players, or transcode a virtual reality SBS video to 2D normal format for playback on PC/Mac, iPhone, iPad, Android, etc. Usually, for some VR Headsets like Google Cardboard, the best VR video format depends on the the devices it connect. For example, if you play a 3D video on Google Cardboard with iPhone 6, you’d make sure your 3D video is 3D MP4, 3D MOV, 3D M4V. But for Android mobile phone, you can play 3D 3GP, 3D MP4, etc on Cardboard. This adapts to many VR headsets in the market, like Freely VR, Sony Morpheu, HTC Vive, PLAY VR, etc. As for those top popular VR headsets, such Samsung Gear VR, HTC Vive, Oculus Rift, PlayStation VR, Google Cardboard, Zeiss VR One, etc, the best VR video formats for Gear VR is 3D MP4, 3D AVI and 3D FLV. The best VR video formats for VR One is 3D MP4 and 3D MOV. For DK, the best VR video formats will be 3DMKV, 3D MP4, 3D AVI and 3D WMV. Top-Bottom 3D is supported by VR headset while the best mode is 3D SBS. UFUWare Video Converter Ultimate is the Ultimate VR video converter on the market, many users have selected it to convert their VR videos. This is very powerful software that can convert nearly any videos to any formats, such as convert VR videos, convert 4K UHD like XAVC/XAVC S, HEVC/H.265, 4K MKV, 4K MOV, 4K MP4, etc and HD videos like MKV, AVI, WMV, MOV, MP4, FLV, MPG, MTS, etc. or rip latest DVD movies to fantastic 3D video available in a variety of formats like AVI, MP4, MKV, WMV, MOV, etc. The output 3D video can be side-by-side 3D, anaglyph 3D, and Top Bottom 3D effect. This 3D video can be played on computer, some 3D TV, glasses-free 3D smartphones, or other compatible 3D display device. It also supports downloading videos from all popular video sites, including YouTube, Yahoo, Vimeo, Dailymotion, etc. You can even use it as a 4K video downloader to download online 4K videos and convert to 3D format for playing with VR headsets like Samsung Gear VR, HTC Vive, Oculus Rift, PlayStation VR, Google Cardboard, Zeiss VR One, etc. How to Create 3D movies for VR with VR Video Converter? Open this VR video converter. You can directly use the “Add File” button to load the ordinary video that you wish to convert into VR format. Or it is also available to drag and drop videos from PC folder into this program. If you want to rip DVD to 3D movies, you can click Load Disc. Click “Profile > 3D Video” and select “MP4 Side-by-Side 3D Video (*.mp4)”, “MKV Side-by-Side 3D Video (*.mkv)”, “MOV Side-by-Side 3D Video (*.mov)”, “WMV Side-by-Side 3D Video (*.wmv)”, or “AVI Side-by-Side 3D Video (*.avi)” from “3D Video” category as the output format. Then set the output folder by clicking “Browse” icon as you need. 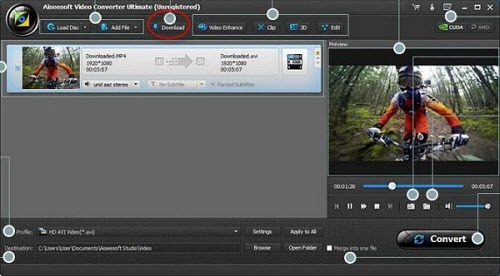 Tips: Before starting the conversion, click the “Setting” on bottom right corner where you are able to adjust the video/audio settings like encoder, resolution, frame rate, bit rate and so on. Also it is possible to change the output folder path as per your need. Return to the Ultimate VR video converter main interface, and hit the “Start” to VR video conversion. Once it finishes, you can get the resulted videos by clicking the “Open” button.